The No. 12 Miami Hurricanes men’s basketball team beat the No. 3 Virginia Cavaliers 64-61 Monday night at the BankUnited Center in Coral Gables, Fla.
Miami only had one day to get right after their 25-point drubbing at North Carolina, their worst of the season. The ‘Canes looked out of sort the entire 40 minutes. It didn’t help that North Carolina seemed to make every shot they took, hitting on 54.6% of their shots with a 45% clip from deep. The Cavaliers presented an equally daunting challenge Monday, entering the game as the No. 3 team in the country. Thankfully, Miami was back at home. Helping the ‘Canes early were the collective voices of the BUC, hinging on each play and referee call. Miami started the scoring when center Tonye Jekiri drew a double-team in the low post and found a wide-open Davon Reed for three. 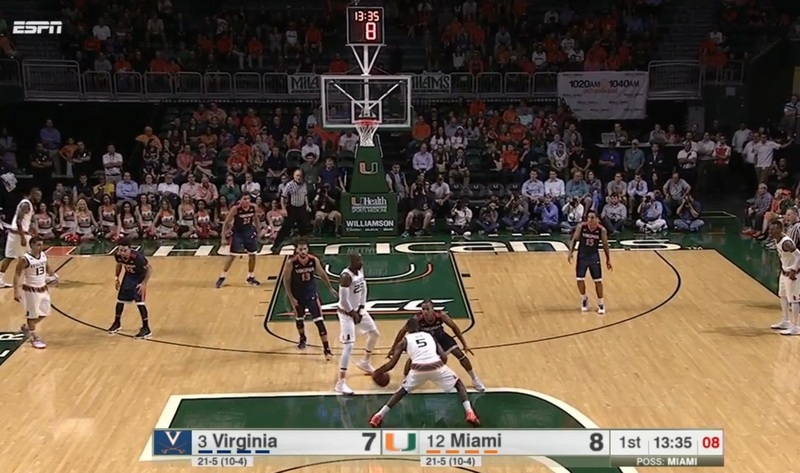 Reed made another three minutes later to account for Miami’s first six points of the game. For Reed and the Miami faithful, it was only a sign of things to come. Two steals by guard Angel Rodriguez lifted the crowd to their feet. Forward Kamari Murphy dominated the glass early with eight rebounds. Each one was met with a round of applause as well. Even with the crowd support, Miami struggled from the field in the first half. Thankfully for the ‘Canes, it is the year 2016. In other words, the three-point shot is as important to a team as it has ever been. Miami finished the game shooting 52.6% from three, a far cry from the 31% they shot against the Tar Heels. 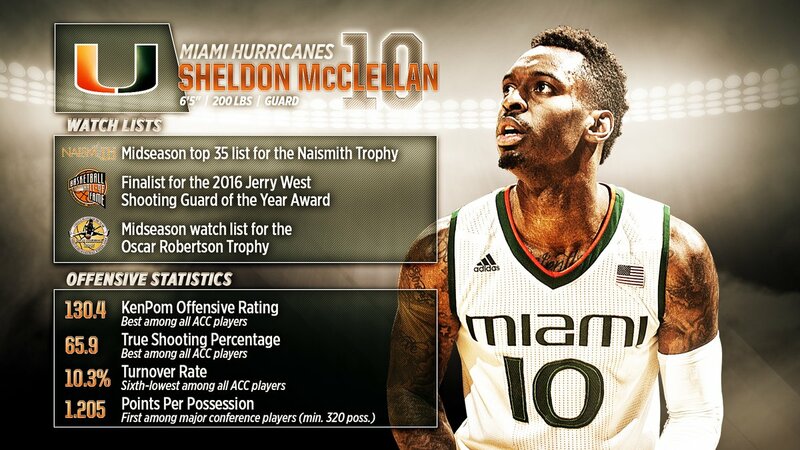 Sheldon McClellan was just one ‘Cane having a hard time getting shots to fall. He missed his first three shots and went 1-5 until the final seconds of the first half. Thankfully, McClellan has practice when it comes to last-second, running three-point shots. The shot was almost identical to the three-pointer he made to close out the first half against Pittsburgh (video of that shot here). McClellan caught the ball with three seconds left (just as he had against Pitt) and sprinted head-long down the court until he reached the three-point line. Once again, he lifted off behind the line and put up a floater with his right hand that hit off the back-iron and in. Yes, a floater worth three points. How often does that happen? Miami took that momentum and ran with it to start the second half. The crowd was sure to let the ‘Canes players hear their appreciation. Rodriguez hit from way-downtown and followed up the shot with a steal on the other end. Reed made back-to-back three’s that put Miami up 10 in the blink of an eye. Sophomore guard Ja’Quan Newton made his presence felt when he stuffed a jump-shot and made a difficult layup on Miami’s next possession. Virginia’s mettle came through when facing the 10-point deficit. The Cavaliers doubled Miami’s point total over the next eight minutes (19-8) to take the lead, 48-47 with 9:38 left. Virginia had only two players make more than one shot in the first half. One had to figure that would change for the No. 3 ranked team in the second. As they have all year, Virginia relied heavily on star guard Malcolm Brogdon. He led all scorers with 28 points on 12-18 shooting. Brogdon had been averaging close to 18 PPG heading into the game. Another Reed three-pointer put Miami up eight, 60-52, with 3:20 remaining. However, Miami went cold and wouldn’t score over the next 2 and a half minutes. As a result, the game came down to one crazy final minute. With 37 seconds left Virginia missed a shot under the basket that would’ve given them the lead. Jekiri hauled in the rebound and was fouled, sending him to the free-throw line. He made the first free-throw to thunderous applause. Clank on number two. Miami up 61-59. Virginia needed one more basket from Brogdon. The only Cavalier to score in double digits put up a three but to no avail. It was only his sixth miss of the game, but it couldn’t have come at a more crucial time for Miami. Even with the miss, Virginia still had a chance to win. Newton made 1-2 free throws, putting the ‘Canes up one before Virginia’s London Perrantes made a layup with six seconds remaining. Once again, enter Davon Reed. The junior shot the ball with confidence all night. He put in two free-throws to make the score 64-61, finishing the game with a career high 21 points. 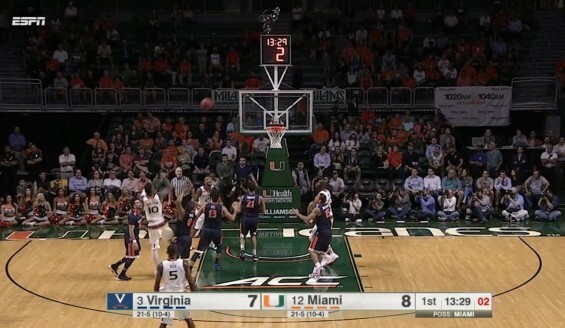 The last two gave Miami a critical three-point lead, forcing Virginia to make a three to send the game into overtime. Perrantes missed his desperation three and sent the crowd into a frenzy. He appealed for a foul call to no avail. The Miami players had to be pretty thankful as well. With the win, Miami (22-5) moves into second place in the ACC. Next up for the ‘Canes: No. 11 Louisville (21-6) Saturday 2 p.m. at the BankUnited Center. The Miami defense came out to play, evident of the ‘Canes determination to bounce back. Miami had 5 steals in total. McClellan was the only ‘Cane other than Reed to score in double figures. He had 11 points on the night. Reed made five of his six three-point shot attempts and all four of his free-throws. It was yet another game in which Reed was a critical cog in a Miami victory.